This year I took on a new commitment--teaching my 1st grader's CCD (religious education) class. And while I'm enjoying it, the planning is definitely taking up a good chunk of my creative time these days. Class is an hour-long, after school, during the week... as you can imagine, those little first graders don't have too much left in the attention-span category by that point in the day. So I've come to learn that having a hands-on project for them is essential to making it through that hour-long class late in the afternoon. Throughout the fall months, it was a bit easier to create projects based around the seemingly unending holidays: All-Saints Day, Thanksgiving, and Christmas, but now in the new year (and with Easter a ways off), I've been looking for some more seasonally-themed CCD ideas, as those tend to resonate with the little ones. 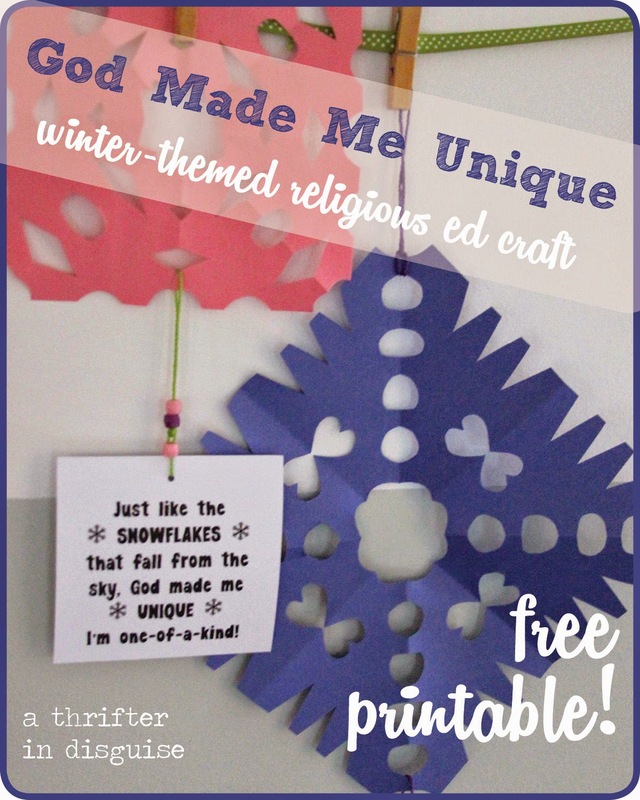 This snowflake craft can tie in with lessons about kids' special relationships with God, in this case, how they were all created to be different. It's pretty straightforward--just plan to be hands-on with them as they go through the process (e.g., cutting and tying knots)! Construction Paper Squares: (cut them into squares ahead of time--whatever size you think is appropriate for your age group. I'm using 8"x8" for the 6-7 year-olds because I figured a larger area would be easier for them to manipulate). 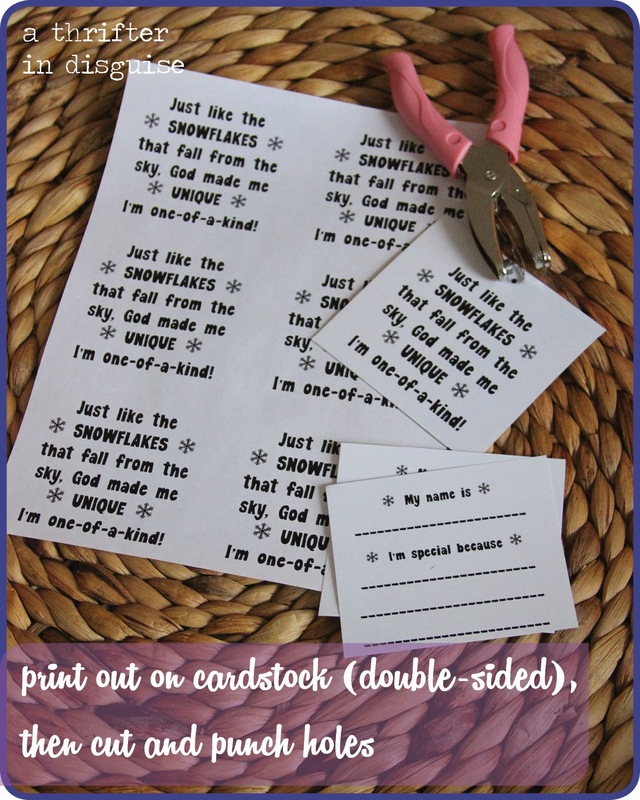 "Unique Like a Snowflake" Poem Cards: You can download my version of the poem here, or just type out your own. There are 2 pages, so you'll need to print it double-sided. I printed ours on cardstock so they are a little sturdier. One page will yield you 6 poems. String for Hanging and Attaching Poem: You'll need 2 ~9" strings for each snowflake. Pony Beads for Accessorizing: These are totally optional, but I find the kids seem to like adding "flair" to their projects. I got these at the dollar store for $1/bag. First, print and cut the snowflake poem cards, then punch holes in top. 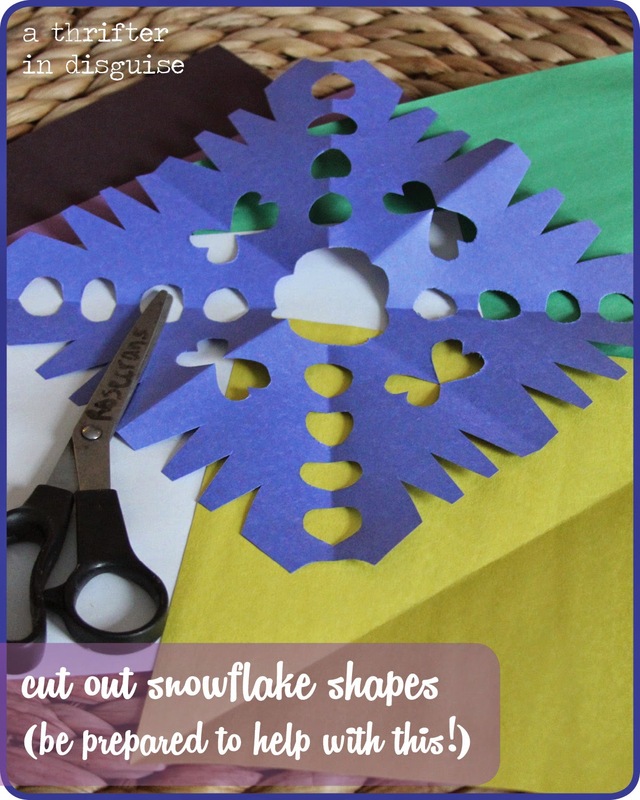 Cut snowflakes from the squares. Depending on the kids' abilities, you may have to be pretty hands-on with this step! Most of my students had never made snowflakes like this before, so I demonstrated to the entire class each step of folding and cutting. 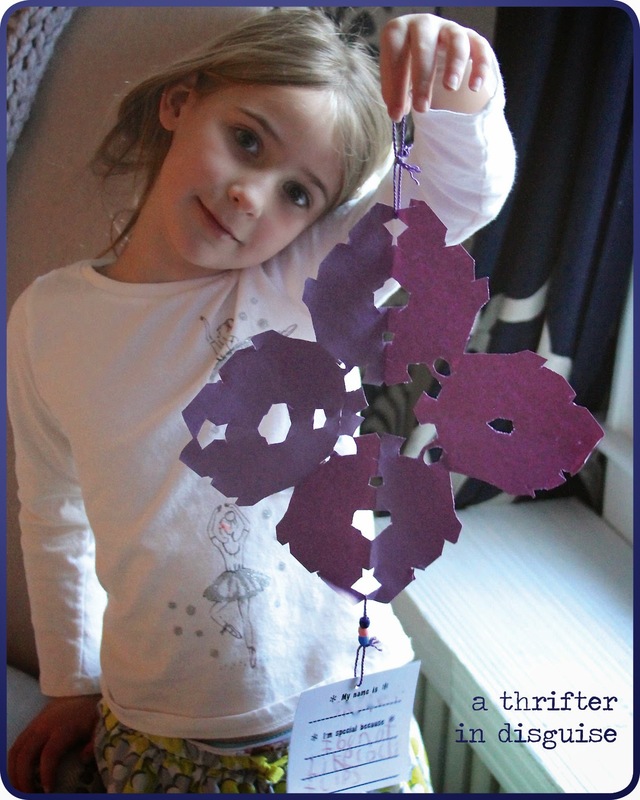 Next, tie a loop to the top of the snowflake with one string, then use the other to attach the poem to the bottom of the snowflake. If you're using the beads, add them at this point, too. FYI - This part took A LOT longer than I anticipated, because I ended up having to tie all of the strings--I don't know why I didn't think about it ahead of time, but tying knots that small was beyond their abilities. Plus, the ends of some of the strings I used started unraveling as soon as they were cut, and that made it a lot harder to string beads! I'd recommend doing a trial run so you can plan for time. To finish up, have the students complete the back side of the poem (or have them do it earlier, if that works better for your timing). Here's my little one holding up her finished project. It was a great project for the first graders, although I was actually really surprised that so few of them had ever cut their own snowflakes before. Which made it really fun for me--seeing their surprise and excitement when they finally opened them up was well worth all the unanticipated knot-tying I had to do! 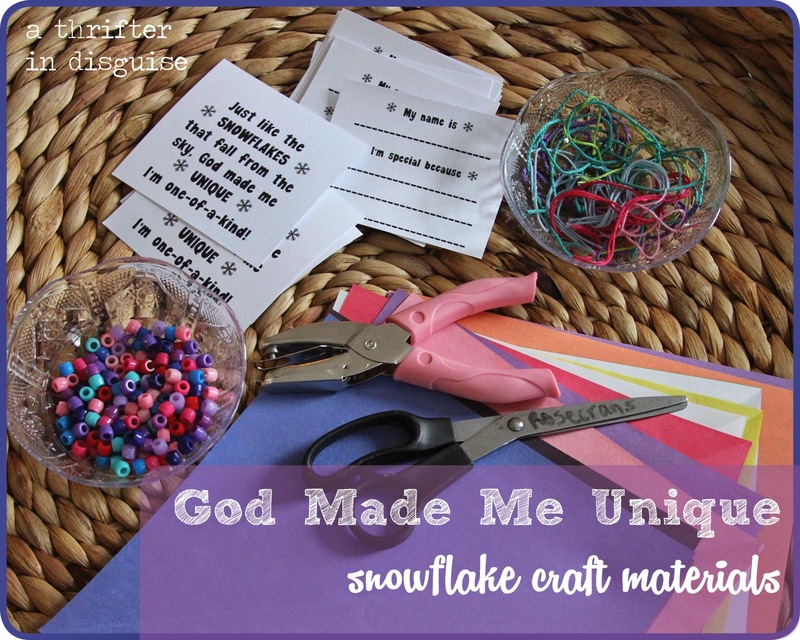 Looking for more religious ed crafts? 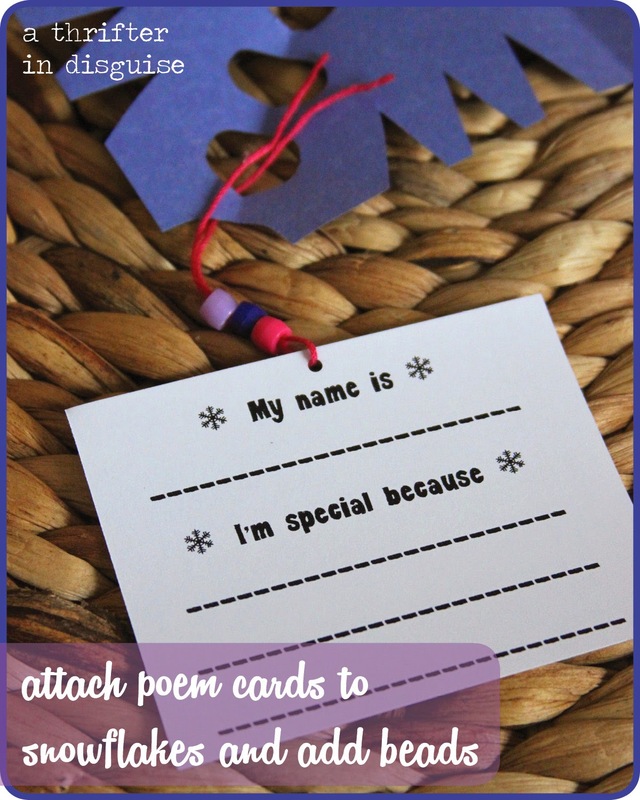 Check out this quick and easy How to Be More Loving project, too! PS. I hope I’m wrong, and he does believe! This Valentine's Day, Don't Forget the Dads!